“When we elect our leaders we fully expect that they will be strong-minded and able-bodied to guide us through the most difficult times. We also expect our leaders to address us directly and offer assurances to the fact that crisis situations will be kept under control”. Unfortunately Nigerians time and time again are often left wondering if their leaders are aware of the concept of accountability. Fresh from a 92 day absence of our President, Umaru Yar'adua in Saudi Arabia, find profiled the noticeable incidents internal and external which have reigned this while, greatly imprinting themselves in the sands of “Nigerian time”. • In December 2009 just before Christmas the unpopular beliefs and policies of CBN Governor Sanusi Lamido struck a lethal blow as thousands of workers were rendered jobless in mass lay offs carried out by many Nigerian banks; the alleged troubled and sound ones alike. Unemployment rates soured with the risk of rising crimes and many a families had a bitter festive season. Government reaction: business went on as usual while the seemingly endless trial of the nauseatingly rich ex bank top shots carried on at snail speed. • Nigeria was at the center of international attention when on Christmas Day December 25, 2009 a 23 year old Islamic Nigerian male Umar Farouk Abdulmutallab attempted to detonate plastic explosives hidden in his underwear while on board Northwest Airlines Flight 253, en route from Amsterdam to Detroit, Michigan USA. Seen as a grave act of terror Nigeria was subsequently put on a Terror Blacklist by the US government and young Mutallab charged on six criminal counts, including attempted use of a weapon of mass destruction and attempted murder of 289 people. He is presently in U.S. custody, awaiting further legal proceedings. Nigerians travelers were thus left to suffer an international backlash while the government more or less barked toothlessly. • Maryam Babangida wife of former head of state General Ibrahim Badamasi Babangida (IBB) passed away on December 27, 2009 in a US hospital having lost her prolonged battle with ovarian cancer. Many people still love to hate IBB for the alleged unprecedented level of corruption during his regime and the annulment of the June 12 1993 presidential elections. Nevertheless Maryam even in death remains celebrated as an icon of beauty, fashion and style", and widely acclaimed as Nigeria's best first lady. Reactions: having spent millions of looted monies on healthcare in the US having neglected our own, the looters of the national treasury and the family alike proceeded to further spend money in consoling and morning their dead. • Much long before the proclamation of Dr Goodluck Jonathan as acting president the turn of events proved that President Yar'adua was by all indications unable or incapacitated to perform his function and therefore should step aside. This arose as Nigeria's new Chief Justice of the Supreme Court; Aloysius Katsina-Alu was on 30th December, 2009 sworn in by the out-going Justice Idris Legbo Kutiji in the absence of President Umaru Yar'Adua. This was legal under the Oaths Act. • Coming on the heels of a similar incident over a year ago in December 2008 and in what amounted to a total failure of leadership by both the Police, Military and Plateau state government, violence started on the 17th of January 2010 and lasted at least four days in Jos. The disturbances were allegedly religiously-motivated as Muslims and Christians took to arms and proceeded to torch down and destroy houses, churches, mosques and vehicles. At least 200 people were killed. Government reaction, a change of heads at the state police’s top boss office and the setting up of another commission of inquiry. • Following an advertorial published in the Punch Newspaper of January 28 by a group going by the name "The True Face of Lagos" accusing Lagos Governor Mr. Babatunde Fashola and the Lagos House of Assembly of corrupt activities. The house members had intended to go on with a probe. But after wide public criticism and protest marches things died down considerable over the past week. Owing most notable to an intervention between Governor Babatunde Fashola and his immediate predecessor Bola Ahmed Tinubu who is though to be displeased with some of the actions of the former, and a court order from a Lagos High Court restraining further actions on any purported investigation of allegations of financial impropriety. • Although things have considerable improved now, the months of December 2009 and January 2010 were hell for motorist in the nation as regards availability of fuel. Long queues sprang up nationwide as Nigerians commercial and private motorist alike were helplessly subjected to hardship in a bid to refill their tanks. Black marketers and those engaged in the up and downstream section of petroleum distribution smiled to the banks as they are want to do perennially. Government reaction: a statement by then Vice President Goodluck Jonathan which was eventually defiled ordering four of his ministers to stay back in Abuja during the Christmas holidays for a series of meetings aimed at finding a lasting solution to the lingering fuel scarcity. • Following growing disbelief by the general populace about the integrity of members of the Federal Executive Council in relation to the president’s absence and the greater good of the nation, Minister of Information and Communication Prof. Dora Akunyili had on 3rd February 2010 somewhat restored her public image when she presented a memo to the Federal Executive Council (FEC) titled "if We Fail To Act Now, History Will Not Forgive Us", asking Yar’Adua to present a letter of vacation to the Senate as required by section 145 of Nigeria’s 1999 constitution. Her action had initially drawn the ire of her colleagues most notably former Attorney-General of the Federation and Minister of Justice Michael Aondoakaa (SAN), prompting a nasty back and forth between them. In the end though swords were sheathed and the objectives were met as Dr Goodluck Jonathan was declared acting president. • In what was hailed as the best move for the country’s hot bed of politics Anambra State. Governor Peter Obi of the all peoples grand alliance APGA on the 6th of February 2010 defied the history books as he won a keenly contested battle for a second term in office against fellow political gladiators Dr. Chris Ngige of the AC and Professor Chukwuma Soludo of the PDP amongst others. Little pockets of irregularities were observed with more than half of the voters disenfranchised owing to the non availability of their names on the voting list. Encouragingly though the results were more or less accepted by all parties involved without the usual electoral court appeal. • After much political anger on the seeming power vacuum, exemplified by protest rallies; most notable by a group of concerned Nigerians called “The Save Nigeria Group” both at home and abroad along with many court cases praying President Yar’adua be impeached or his Vice Goodluck Jonathan be empowered. The National Assembly had on February 9th 2010 creatively interpreted one of the clauses of the constitution, in their words in the best interest of the nation and voted to declare Goodluck Jonathan Acting President. This was greeted by much cheers round the world as intent by Nigeria to get a start on the process of nation building at a renewed refreshed pace. • More failings of President Umaru Musa Yar’Adua emerged as Acting President Goodluck Jonathan was on Tuesday February 16, 2010 elected Chairman of the Economic Community of West African States (ECOWAS) by the group's Heads of State and Government thus extending for another year Nigeria’s leadership. 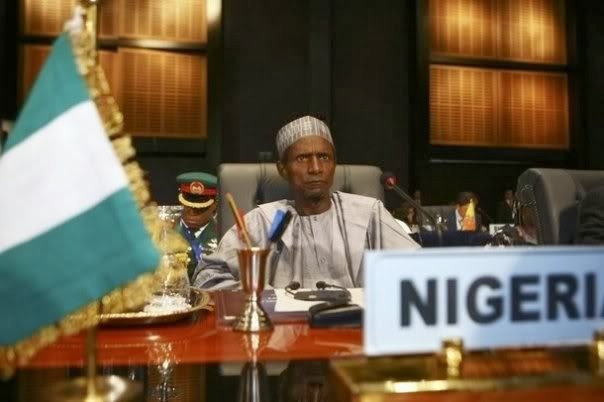 President Umaru Musa Yar’adua had steered the ship of the association for a year until he fell ill, a development which had twice forced the postponement of the 37th Summit of the body. • On the back of an unpopular decision by erstwhile president Mamadou Tandja to extend his mandate beyond December 2009 having already served two terms a coup d'état occurred in Niger, a country sharing boundaries with Nigeria to the north on the 18th of February 2010. Soldiers attacked the presidential palace in Niamey at midday and captured the President who was chairing a government meeting at the time. Later in the day, the rebels announced on television the formation of a ruling junta, the Supreme Council for the Restoration of Democracy to be headed by squadron leader Salou Djibo. • On the 22nd of February 2010 members of The Edo State House of Assembly abandoned all sense of decorum as lawmakers purportedly impeached the Speaker, Rt. Hon. Zakawanu Garuba. In what appears to be an inter party strife the erstwhile speaker a member of the ruling People’s Democratic Party has been replaced by Peter Usman Aliu of the AC. Confusion is still the order as the house has not yet sat since the incidence with both members Rt. Hon. Zakawanu Garuba and Rt. Hon. Peter Usman Aliu presently claiming the title of speaker. • Finally there were one too many alleged political assassinations, reminiscent of a case of kids turning the house upside down in their parent’s absence. The death toll included ex AIT reporter Efenji Efenji (February 14th) and Action Congress gubernatorial candidate in 2007 general election in Ogun State, Otunba Dipo Dina (January 25th, 2010). Honestly, your starting this great piece with a quote from el-rufai totally spoilt it for me. sane words though but coming from him, it deeply nuseates me given that not so long he was part of the cabal making life difficult for us and now that he is out of favour with the powers that be he is jumping all over the internet making like he is some ... kind of "Man of the People". I refuse to be a victim of amnesia. I remember.That said, i must state that this writeup is a very good review of all the happenings in our clime in the recent past. it has got it all...the good, the bad and the down right shameful. You know what, It gladdens my heart that there are Nigerians out there who think the way you do. I only hope they are much more than I think they are, and then there will be hope for this country. Moments like these are what make Nigerians seek to go overseas in search of fortune and maintaining what's left of their sanity.I thank God, I didn't do my higher education in Nigeria cos I would been so frustrated to the point where I would give up on life TOTALLY. That was the whole scenerio just that (maybe) u forgot the resignation of a minister-i think the PET minister and the indirect demotion of our ANDOAK by the acting and maybe active president. (or i was in a rush to see that while going through the write-up. ).